We first saw the robot Zowi (top row in the banner photo) at Make Munich a few weeks ago, and we were very impressed by how much interesting motion they were getting out of the ‘bot for only using four servo motors. The combination of big feet, strong ankle joints, and clever programming let the cute little bot stand on one leg, do a moonwalk, and even hop. (See the video, below the break.) We knew it was for sale. What we didn’t know is that it was entirely open source. [Javier Isabel], the inventor, is very good at giving credit where it’s due, and that’s a great thing because his ‘bot is basically an improved BOB robot. That said, you really need to see this thing moving to know what a difference Zowi’s significantly stronger servos and clever programming can make. But that’s not all! Since everything about Zowi is open, and up on GitHub you can not only 3D print one of your own, but you can easily modify the attractively-boxy case. And a handful of people have taken [Javier] up on the offer, and submitted their modifications back as pull requests. So if you’d rather something mildly more humanoid, and are willing to add a couple more servos, there’s a good basis for your explorations ready to go. We really like the idea of collaborative toy-robot design, and from what we’ve seen the basic Zowi platform is a winner. Check it out and see if you’re not inspired to add your own personal touch to the design. If you do, be sure to contribute back for others to see! Thanks [Nils Hitze] for the tip! Now how’s this for an expo costume? [AEInnovations] put together a set of Droid helmets that talk to each other in droid speak! Before you get too excited, we have to let you know, they aren’t actually translating anything. One, there’s no such thing as a complete droid speak language from Star Wars, and two, it’d be ridiculous. No, what he’s created is a bit simpler, but nonetheless awesome and very clever. The helmets have walkie talkies built in, so two people wearing the helmets can simply talk to each other, in plain old English — well, or maybe Klingon. But when you speak, a sensor in the helmet notices you speaking, and starts broadcasting a randomized droid speech for everyone else to hear. [Adam Woodworth] tries to build some kind of RC plane every month. He’s been at it for almost a decade, and he’s getting pretty damn good at it. By day, he’s a Hardware Engineer at Google, though he went to MIT for Aerospace Engineering. Coincidence? We think not. His latest project is an Imperial Shuttle drone, or to be specific, a Lambda class imperial shuttle — the infamous Shuttle Tydirium. You have to watch this thing unfold. Using paper model plans, [Adam] printed out the shuttle on a combination of 3mm and 6mm thick foam board (Depron), and then assembled it. This kept the model light enough that the set of quad rotors would have more than enough power to fly it around. The Chinese New Year is something we keep in mind at least half of the year, and probably still don’t plan for properly. In case you’re new to the situation: The Chinese New Year celebration empties out Shenzhen of its more than 12 million residents for the better part of a month. It’s the one time of year that manufacturing sector workers (and everyone that supports that ecosystem) travels home to visit family. For those involved in manufacturing goods in Shenzhen, this part of the year leaves us cut off from one of our vices and we count the days until our tracking numbers and order confirmations start to show signs of life. It’s an inconvenience of an entirely different nature if you are one of the lonely few that stays in the city during the holiday. [Ian] over at Dangerous Prototypes wrote a blog post from his office in Huaqiangbei which is a sub-district of Shenzhen, China to share the experience with us. Shenzhen is uniquely a migrant-worker city, and when emptied of the factory employees there are not enough people to patronize local services like markets and restaurants so they also shut down. But an empty city offers its own interesting entertainment like wicked fireworks sessions. As always, [Ian] does a great job of sharing this peculiar part of Shenzhen culture. He also kindly points out some of the offensive offers that come through the inter-webs from desperate customers who have poorly planned around the holiday. An engineer with a 3D printer wants everything to be rigid and precise. Wobble induced by flex in the z-axis feedscrews, for instance, makes telltale wavy patterns in the surface that match exactly the screw pitch. Nobody likes those, right? Certainly not an engineer! But one man’s surface irregularity is another man’s ornamentation. 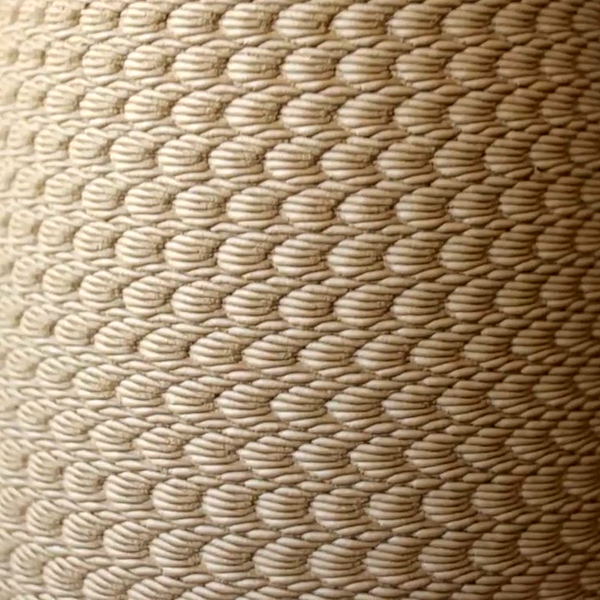 The details we have are sparse, but from looking at the video (also inlined below the break) it’s clear enough: [Olivier van Herpt] and [Ricky van Broekhoven] stuck a vibrating woofer underneath the print bed of their ceramic printer, and use it to intentionally ruin their smooth surface. And they do so to great artistic effect! We’re not suggesting that you give up entirely on your calibrations, but we do appreciate a little out-of-the-box thinking from time to time. But then our internal engineer raises his head and we wonder if they’re linking the pitch of the woofer to the feed rate of the print head. Your thoughts in the comments?